Laziness use to be a guilty pleasure. Even on cold winter days, I had no problem finding something inside to do. Two winters ago I re-finished twenty upstairs wood windows and painted every wall and ceiling surface, including the bedroom pictured above. 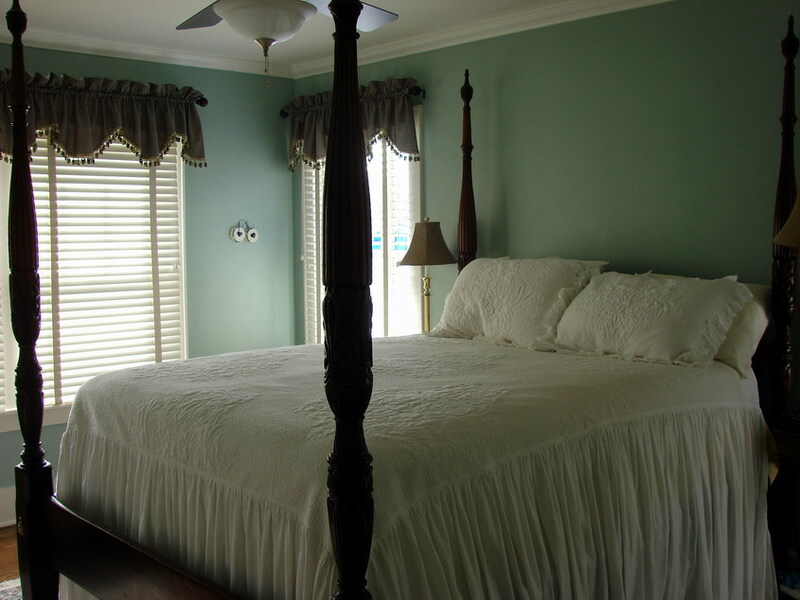 I chose a soft turquoise with white bedding to remind me of the beach. These days, the idea of observing a sabbath rest is slowly gaining more appeal. Maybe it’s the company I keep; with my husband in the middle of a two-week holiday, each morning I find myself sleeping in later and later. While I miss the discipline of early risings, I can’t quite bring myself to leave that warm bed on a cold morning, especially when I know there’s a foot of snow lying just outside my window. It was almost eight o’clock before I stirred this morning. A subtle moving of my legs was enough to summon two soft brown poodle eyes to pay court by my bedside. It’s my morning task to tend to the needs of our doggie trinity. The dogs will not leave the bedroom without me it tow. Once I’m up — with robe on and feet in slippers — Max gallops down the stairs while I gingerly tread at a more sedate pace; Maddie and Cosmo are not far from my side. I let the dogs out and begin gathering up their bowls to make breakfast. Today’s menu is kibbles with an aperitif of Rocket Roll and Turkey. Breakfast is served, the starter is devoured and a few token kibbles are eaten. Then it’s time for a second trip outdoors. I am surprised that the dogs don’t mind going out in the snow. In fact, they are staying out longer than usual. Sometimes it’s for a bit of frolic and other times it’s for other good reasons. My friend Kelli is the source of the “other good reasons.” Santa-Kelli sent each of our dogs two bones for Christmas. Not to tell tales, but Max is enjoying more than his fair share of bones, which forces his sisters into defensive bone maneuvers. Maddie ‘s strategy — taking her bone outside to bury in the snow — is not working. I know because I found Max sprawled on top of hard-packed snow ravishing one of Maddie’s icicle bone-pops. There are so many ways to enjoy a bit of sabbath rest. While Max enjoyed his turkey to later sprawl on icy snow with stolen bone, my daughter Kara and son-in-law Joe stole away to rest their bones on warm sand in the Turk and Caicos. Whether its Turk or turkey, sand or snow, or even a warm comfy bed… taking time to be lazy can be feast for the soul. With a good book or bone it’s paradise. Even when the turquoise waters and white sandy beaches are walls and bedding… or sky and snow.